Looking toward the eastern horizon on a cool, mid-November evening the Autumn constellations are on prominent display while those of Winter are just starting to rise, and the constellations of Summer are setting in the west. Almost due east is the bright star Capella, in the constellation Auriga. Between Auriga and the constellation Andromeda lies the constellation Perseus, known for the famous double cluster and Algol, the Demon star. The name Algol comes from the Arabic, and means “head of the ogre,” hence the English translation of Demon Star. 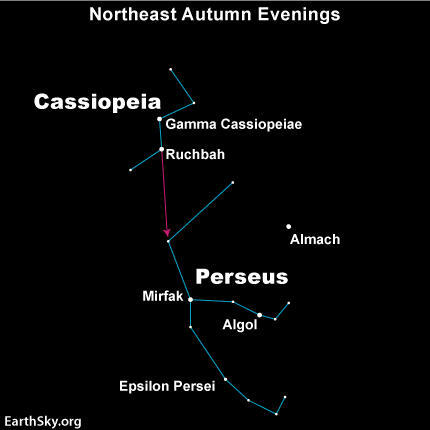 Fittingly, Algol is on prominent display in the eastern sky around Halloween. A variable star, it is usually the second brightest star in the constellation Perseus, and hence the designation Beta Persei. Algol, 93 light years distant, is actually a multi-star system, with two members, a hot blue-white star and a cooler yellow-orange subgiant star, so close together that they revolve around their common center of gravity, once every 2.9 days. Because their orbital plane is aligned with us, the two stars appear to eclipse each other. When the fainter, cool star partially blocks the brighter star, the sudden dimming is dramatic. Conversely, when the brighter star partially blocks the dimmer companion, the total brightness drops much less, but over the same period. The more dramatic dimming is readily discernible by naked eye. As the most prominent member of the class of variable stars, similar eclipsing variable stars are known as Algol variables. Algol’s variability was first surmised by the deaf English astronomer John Goodricke, who observed Algol in 1782 from the Treasurer’s House of the York Minster in York, England. The confirmation that Algol was, in fact, an eclipsing binary star system was made almost one hundred years later by the American astronomer Edward Charles Pickering. When you go out over several nights to look at the sky you will readily notice the changing phases of the Moon. Over several days you may even notice the movement of planets, such as Mars, which is currently low in the southwest and unmistakable due to its brightness and color. Planet magnitudes also vary as their distance from the Sun and Earth changes. We are normally less familiar with changes in the magnitude of stars. Discover Algol for yourself and follow in the footsteps of John Goodricke and other astronomers, who have studied variable stars. Western Slope Skies is produced by members of the Black Canyon Astronomical Society. This episode was written by Bernie Forman and recorded by Bryan Cashion.